Ever walk into a Starbucks and wonder: why didn't I think of this? But, honestly, do you really understand the merchandising mechanics of getting a million people to line up for a tall vanilla latte, or of matching up a dark green mug and a Norah Jones CD with a drink order? Rubinfeld, Starbucks's former executive vice president of store development and an advisor to other well-known brands, has given it all quite a bit of thought, and with a writing assist from Hemingway-who also co-authored Bill Gates's book Business @ the Speed of Thought-he painstakingly shares his blueprint for creating financial and cultural retailing success. This is by no means a relaxing corporate history on the rise of a global coffeehouse. It's an intense examination of what goes into conceptualizing a viable retail plan. Whether it involves serving sushi on a conveyor belt or selling sunglasses, he explains how to grow a franchise into a powerful marketing presence. From the initial ""ideation"" and differentiation of the concept, to choosing the right location for the first store, making the design and merchandising decisions, and attracting venture capital-Rubinfeld walks anyone who wants, or needs, to understand retailing through the thought process at every decision-making opportunity. He does so while continuously drawing examples from the local mall, explaining concepts in terms of what retailers like Oakley, Chico, Potbelly Sandwiches and, of course, Starbucks have done right. He also shares his insights on what others, like the bankrupt candle company Illuminations, did wrong. 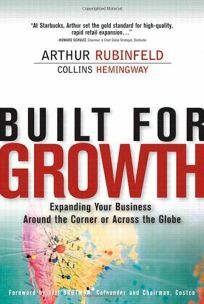 Rubinfeld sidesteps jargon and avoids cute or memorable phrases... save one: ""retail is detail."" The phrase aptly summarizes the contents of this book-which in its latter chapters even delves into the minutia of real estate management. This is an intricately detailed game plan for becoming the retailing world's next Starbucks.